When SAIL’s judges were weighing the candidates for the 2012 Best Boats daysailer award, there was no dissension over the winner: the BayRaider 20 scored a unanimous thumbs-up for its blend of portability, performance, good looks, build quality and innovation. The BayRaider’s genesis is the “raid,” a popular pastime in Europe where small boats are sailed and rowed competitively between harbors in events lasting several days. 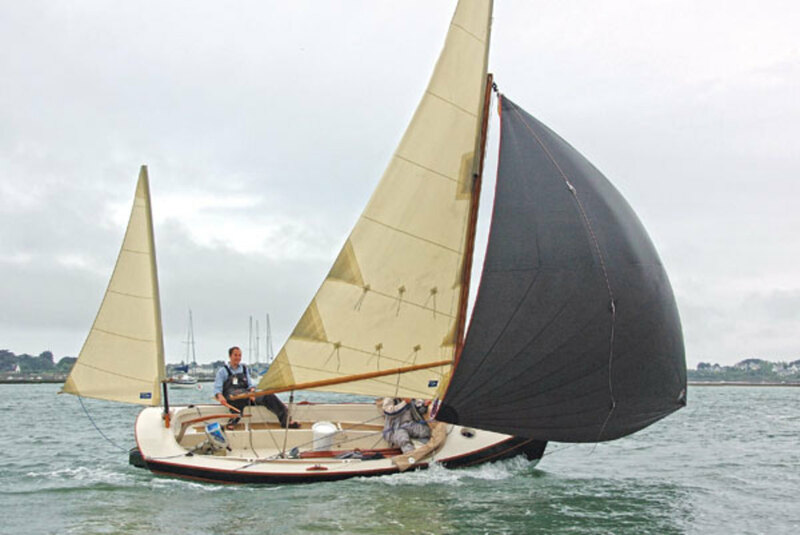 Speed under sail, light weight for easy rowing and the ability to stand up to foul weather are obviously desirable in such contests, and so designer/builder Matt Newland developed a series of unsinkable boats to meet those criteria. Capsizing is the Achilles heel of lightweight unballasted open boats, so Newland increased stability by means of a clever gravity-fed water ballast system that lets the boat heel to 125 degrees before inverting—that’s better than a great many ballast-keel boats. The water ballast can be taken on or dumped while underway, and should the boat flip with its ballast tank empty and want to stay upside down, a tank on the port side will flood and cant the boat enough that a crew’s weight on the centerboard will right it easily. The hollow mast and carbon fiber sprit are sealed, so they provide buoyancy as well. It’s this kind of versatility that makes the BayRaider such an intriguing boat. The fiberglass version—you can order it in epoxy/foam or epoxy/wood too—displaces less than 1,000 pounds, so even though the sail area is fairly modest, given enough breeze the unballasted BayRaider will hop up onto a plane and hit double-digit speeds. When it comes time to beat back into that same breeze, just open the valve, fill up the ballast tank, sheet in the sails and settle in for an enjoyable beat. The BayRaider is a pleasing blend of modern technology and traditional looks. The sliding gunter rig is rare on this side of the Pond, but it makes sense for trailering—both spars fit inside the boat. The mizzen does not add a lot of sail area, but it helps to balance the helm and in light air, such as we had on my test sail, every bit of canvas helps. With two of us on board, the BayRaider showed plenty of willingness to please in the 6 knots or so of wind that got her scooting along happily, water gurgling satisfyingly along her hull. Between the slight chines at the waterline, the centerplate and the large rudder, she feels solid and forgiving to helm. Wide bench seats run the length of the cockpit. Buoyancy tanks for positive flotation are molded into these seats, but there are a couple of lockers to take lines and odds and ends, and enough room under the foredeck to stash your sailing bag and a small cooler. It was too bad the spinnaker had not yet arrived, because conditions were ideal for it; I was left feeling that the boat had a lot more to give, and it was with some reluctance that we fired up the outboard and took the sails down at the end of the day. With practice, I doubt it would take more than 10 to 15 minutes to rig or de-rig the boat. The mast is on a tabernacle, so you just have to unmount the gunter sprit and roll up the sails, leaving all the shrouds in place. I drove away thinking it would be fun to have a boat like this, a perfect little gunkholer that can stand up to a decent blow without scaring its crew witless.